Two main groups of morphologically unusual proteobacteria include spirillum and prosthecate bacteria. Spirillum in microbiology refers to a bacterium with a cell body that twists like a spiral. It is a genus comprising elongated forms with clusters of flagellae at both poles. Spirillium usually live in stagnant water rich in organic matter. They are twisted and aerobic, and are highly flexible, like a spring. Spirillum: Spirillum in microbiology refers to a bacterium with a cell body that twists like a spiral. Prosthecate bacteria are a non-phylogenetically related group of Gram-negative bacteria that possess appendages, termed prosthecae. These cellular appendages are neither pili nor flagella, as they are extensions of the cellular membrane and contain cytosol. Prosthecates are generally chemoorganotrophic aerobes that can grow in nutrient-poor habitats, being able to survive at nutrient levels on the order of parts-per-million – for which reason they are often found in aquatic habitats. These bacteria will attach to surfaces with their prosthecae, allowing a greater surface area with which to take up nutrients (and release waste products). Some prosthecates will grow in nutrient-poor soils as aerobic heterotrophs. One notable group of prosthecates is the genus Caulobacter crescentus, a Gram-negative, oligotrophic bacterium widely distributed in fresh water lakes and streams. Caulobacter is an important model organism for studying the regulation of the cell cycle, asymmetric cell division, and cellular differentiation. Caulobacter daughter cells have two very different forms. One daughter is a mobile “swarmer” cell that has a single flagellum at one cell pole that provides swimming motility for chemotaxis. The other daughter, called the “stalked” cell, has a tubular stalk structure protruding from one pole that has an adhesive holdfast material on its end, with which the stalked cell can adhere to surfaces. Swarmer cells differentiate into stalked cells after a short period of motility. Chromosome replication and cell division only occurs in the stalked cell stage. The second word of its name (crescentus) refers to the fact that it forms a crescent shape; crescentin is a protein that imparts this shape. Caulobacter crescentus: Caulobacter daughter cells have two very different forms. One daughter is a mobile “swarmer” cell that has a single flagellum at one cell pole that provides swimming motility for chemotaxis. The other daughter, called the “stalked” cell has a tubular stalk structure protruding from one pole that has an adhesive holdfast material on its end, with which the stalked cell can adhere to surfaces. Swarmer cells differentiate into stalked cells after a short period of motility. Spirillum in microbiology refers to a bacterium with a cell body that twists like a spiral. Prosthecate bacteria are a non-phylogenetically related group of Gram-negative bacteria that possess appendages, termed prosthecae. Caulobacter is an important model organism for studying the regulation of the cell cycle, asymmetric cell division, and cellular differentiation. 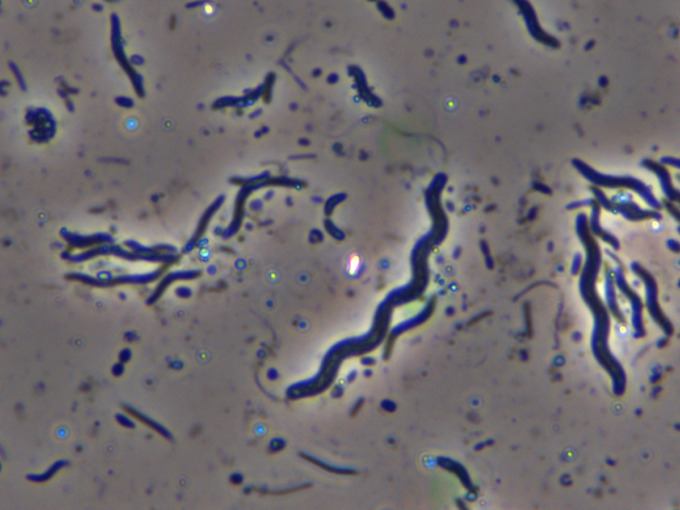 spirillum: Any of various aerobic bacteria of the genus Spirillum, having an elongated spiral form and bearing a tuft of flagella. morphologically: In biology, morphology is a branch of bioscience dealing with the study of the form and structure of organisms and their specific structural features. prosthecate: Prosthecate bacteria are a non-phylogenetically related group of Gram-negative bacteria that possess appendages, termed prosthecae. These cellular appendages are neither pili nor flagella, as they are extensions of the cellular membrane and contain cytosol. One notable group of prosthecates is the genus Caulobacter.